One the most useful home remedies, lemon works well in a host of common complaints. The traditional drink of lemon and honey can be spiced up with ginger and garlic to make a potent brew for colds, flu, coughs, and digestive disorders. Overall, the fruit improves resistance to infection. The juice is taken as a cleansing drink, rich in vitamin C and antioxidant bioflavonoids, stimulates liver metabolism and detoxification. Diluted juice of a freshly squeezed lemon makes an excellent pre-breakfast drink. The juice makes an effective mouthwash and gargle; to achieve best results add a pinch of chili (Capsicum spp.) for mouth ulcers, gingivitis, and sore throat. It also stimulates the appetite, aids digestion, and improves absorption of iron. Its action on the liver means that it helps to reduce the tendency toward allergic reaction and promotes the elimination of waste products. Avoid drinking the juice neat, as it is strongly acidic and can dissolve tooth enamel. Brush teeth after drinking lemon juice. Lemon seeds, like grapefruit seeds, are antiseptic, and can be taken crushed or chewed to treat candidiasis and other fungal problems. The peel and pith contain high levels of essential oil and bioflavonoids, making extracts valuable supplements for many chronic health problems, including circulatory disorders such as arteriosclerosis, varicose veins, and poor peripheral circulation. Applied topically, the juice and essential oil help to heal acne spots, chilblains, and insect stings and bites. On fungally infected nails, apply 1–2 drops of essential oil a day. The seed is best sown in a greenhouse as soon as it ripe after thoroughly rinsing it. Sow stored seed in March in a greenhouse. Germination usually takes place within 2 - 3 weeks at 13C (55F). Seedlings are liable to damp off so they must be watered with care and kept well ventilated. When large enough to handle, prick the seedlings out into individual pots and grow them on in the greenhouse for at least three growing seasons before trying them outdoors. Plant them out in the summer and give them some protection from the cold for their first few winters outdoors. 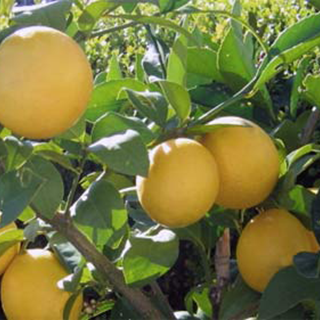 Depending on the climate, fruits may take 6 to 8 months to ripen; lemons do not well if they are picked before they are ready. Unlike other types of fruit, citrus does not continue to ripen once it is picked from the tree. Harvest the fruit by cutting them off with pruning shears or by pulling the fruit stalk from the tree. Undamaged fruit can be stored for several weeks at cool temperatures.